The game revolves around a new dice mechanic, where players will use guild and pirate dice to gain access to different captaincies to hire the four influential noble characters hosted in the main buildings of the island, and to determine the cost of performing the action of the building currently associated with the hire character. The Crown of Portugal has a series of requests that deal with undertaking expeditions, urbanization, opening trade routes, increasing wealth and controlling the guilds on the islands. Players will gain prestige points for fulfilling these requests. An initial view of the game can be quite overwhelming. 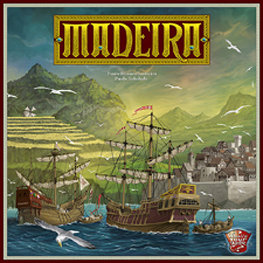 It is a very busy and well-filled board with a variety of tiles that will determine your victory conditions and others that will add bonuses and benefits during the course of the game. The five turn game sees each turn divided into two halves. The first half, called the Character Phase, involves using the three dice you will have chosen at the start of the turn to activate one of the Character areas to perform an action such as shipping resources [wine/sugar or wheat], buying a special benefit tile, harvesting etc. In the second half you will be potentially able to activate a number of buildings and their functions. Explaining how to play the game can leave a new player feeling totally overwhelmed with information, but no more so than Bora, Bora or Terra Mystica. Once played everything starts to tie in and hang together. Even then expect to set aside a good 3 hours to complete a four player game. Personally, this is one of my favourites and like all the best games once you get the engine of the game running smoothly it's a great experience, that involves many interacting elements not least your opponents and their choices and actions. Oh, and don't forget those pirates that act in game terms a lot like paupers in Martin Wallace's London. It scales perfectly with 2, 3 and 4 player sessions each providing a really rewarding gaming session. Provided you don't want a light weight game, I can't recommend this too highly.